It seems unlikely that Maestro Kent Nagano had the Oscars’ weekend in mind when he planned this season’s schedule for the Orchestre Symphonique de Montréal (OSM). Nevertheless, there was measure of serendipity in the timing of the four sold-out concerts this week at the Maison Symphonique which included two works by Mozart so famously featured in the multiple Academy Award winning film Amadeus. Although Amadeus was not mentioned anywhere in the program notes, the dramatic initial passages of Mozart’s Symphony number 25, showcased in the opening sequences of Miloš Forman’s 1984 Best Picture, were familiar to almost everyone in the hall. Mozart is said to have composed this work, his first symphony written in a minor key, over a period of only two days during the summer of 1773. He was just 17 years old at the time, but the work shows the hands of a master. Although the Symphony contains many tuneful passages, it marks a break with his simpler, “pretty” style of composing. The OSM’s performance was aural excellence, showing great precision, yet forceful and full of energy. The first and second violins were placed on either side of Mr Nagano with great effect. Mozart’s affection for the oboe is well-known and he would have been pleased with the wonderful work of OSM principal Theodore Baskin in the many passages featuring the instrument. The main attraction of the concert was Mozart’s Requiem, upon which the composer was working during his final illness at the young age of 36. Mozart died before its completion, and apparently his widow requested one of his pupils, Franz Xaver Sussmayer, to finish the score. The idea presented in Amadeus that “rival” composer Antonio Salieri was at the dying Mozart’s bedside, urging the genius on to complete the work, with the intent to pilfer it and present it as his own composition, appears to be fiction. Some musicologists might view the finished Requiem as flawed, but there was nothing wanting in the OSM’s performance which was spot-on perfect, with the instrumental musicians and choir working at a very high artistic level. The four vocal soloists, all of whom are Canadian, sang with beauty, clarity and conviction. In keeping with the film theme of this Blog, we might say, using an analogy from this year’s Oscar nominated film Moneyball, that the OSM players, choir and guest soloists hit a musical home run. The first composition performed at the concert was by contemporary artist Pierre Boulez which, according to the program notes, he revised several times from 1948 until 1965. Despite the explanation with which Maestro Nagano favoured the audience prior to the first downbeat, this composition’s overall feeling of jolting dissonance and ‘60s musical effects led to only polite applause at the conclusion of its two movements totalling some 11 minutes duration. This was too bad considering the fine playing of the musicians and exceptional performance by soprano Rayanne Dupuis. All in all, this was a memorable concert. Your blogger and his wife had the opportunity to meet the two male soloists and a choir member after the Saturday evening concert, the three of whom were very friendly and gracious indeed. 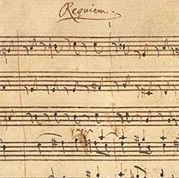 Photo: First page of Mozart’s Requiem, in the master’s own hand. Wikimedia commons.